Hedge fund manager Scott Fearon explains why failure in business is not only common but necessary and how spot-ting it early can pay off Unlike most investors, who live in fear of failure, Scott Fearon actively seeks it out. He has earned millions of dollars over the past thirty years shorting the stocks of businesses he believed were on their way to bankruptcy. 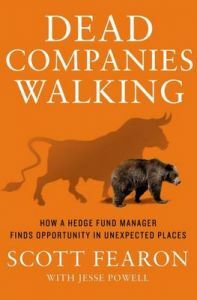 In Dead Companies Walking, Fearon describes his foolproof formula for spotting these doomed businesses and how they can be extremely profitable investments. In his experience, corporate managers routinely commit six common mistakes that can derail even the most promising companies: they learn from only the recent past, they rely too heavily on a formula for success, they misunderstand their target customers; they fall vic-tim to the magical storytelling of a mania, they fail to adapt to tectonic shifts in their industry; and they are physically or emotionally removed from their companies' operations. Fearon has personally interviewed thousands of executives who were headed, unknowingly, for bankruptcy from the Texas oil barons of the 80s to the tech wunderkinds of the late 90s to the flush real estate developers of the mid-2000s. Here, he explores recent examples like JC Penney, Herbalife and Blockbuster Entertainment to help investors better pre-dict the next booms and busts and come out on top.